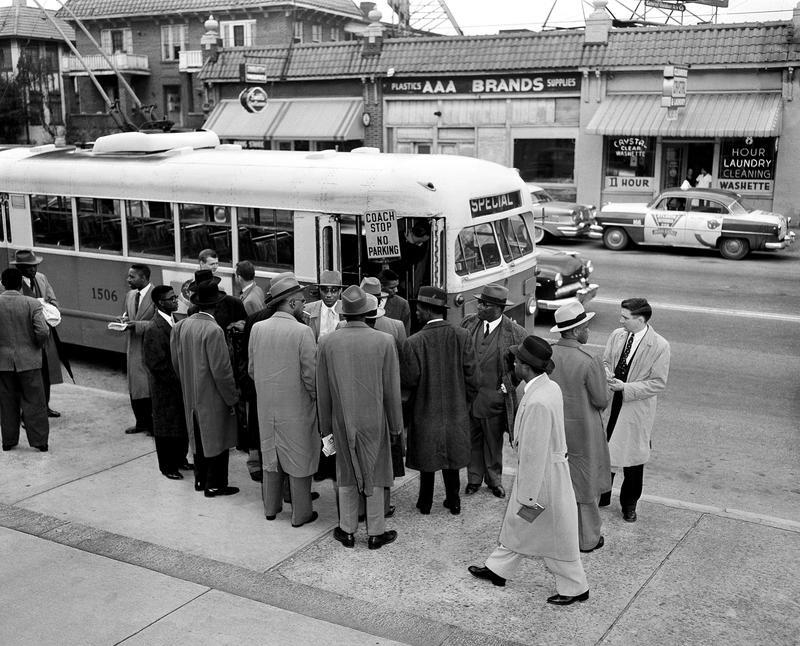 Clergymen stand around the front door of a public bus during a civil rights protest in Atlanta, Jan. 9, 1959. BROOKE GLADSTONE: Thus far, our program has centered on the personal car in its infrastructure. This is no accident. The car speeds, stalls, thrills and kills us all because we need a ride–to happiness maybe or liberty or nowhere? It's not the destination that matters, right? Just the journey. But what if we'd really rather journey by bus. Kafui Attoh is a professor of urban studies at the City University of New York Graduate Center and the author of Rights in Transit: Public Transportation and the “Right to the City in California's East Bay. In that forthcoming book, he argues that transit rights are more than just the mere option to choose a bus over a car. And also more than the problem of point A to Point B mobility. He began by explaining the motivation in the 1970s and 80s behind ADAPT, originally Americans Disabled for Accessible Public Transit. KAFUI ATTOH: The big the demand was wheelchair lifts. In the 1970s and 1980s, there were provisions at the state and local level to provide transit access to citizens with disabilities. And that often took the form of paratransit. BROOKE GLADSTONE: Paratransit is you can order up a ride that they'll come to your door. KAFUI ATTOH: It's ubiquitous and it's an extremely important service. But the demands of ADAPT went beyond that. They said, 'we would also like the right to use the public buses like everyone else.' It was not simply a demand to get from point A to Point B. It was a right to be able to get on the public bus and not have to call hours in advance. To do it on your own terms and to do it as part of a larger public, mobility in cities is central to living a dignified life. BROOKE GLADSTONE: And do we have a right to a dignified life? KAFUI ATTOH: I'd hope so. The definition I use in the book and that many political philosopher share is that it's a moral minimum. It's the least that society owes you as a human being. And that to infringe on that is to treat you as not a human. Transportation falls in that realm. If you can't get to the polls to participate in the most narrow sense in our democracy. If you can't get there because of lack of a private automobile then we have a problem. BROOKE GLADSTONE: The ride hailing companies Uber and Lyft got some good press earlier this month when they offered discounted or free rides to the polls on Election Day. And as laudable as that was you see some sort of hidden cost here. KAFUI ATTOH: I think it's incumbent on cities to not rely on the goodwill of a private entity to fulfill a basic function. Now think about if there was a ballot initiative to ban Uber in cities. Do you think Uber would be providing rides to the polls? I don't think so. That's just my that's just a guess. BROOKE GLADSTONE: There is a political argument you suggest in your book over what a city should be and could be. KAFUI ATTOH: This gets into an argument that comes out of Marx and Engels that emerges from the manifesto. For Marx and Engels cities promise to rescue a considerable proportion of the population from the idiocy of rural life. Right from the country was an isolating life, apolitical life. And they were using idiocy in this particular way. They weren't saying that people in the country were dumb or stupid. They were using idiocy in its classic sense. The Greek word ‘idiote’ or ‘idiotis’, someone who is isolated and separate from the public life of the cities–the politics of cities. Cities at that time, places like Manchester or Liverpool or Glasgow these are the first cities that are showing the world what industrial capitalism will mean. Pushing people into situations in which their shared immiseration was really hard to ignore. So for Marx and Engels, they held out a promise for collective action for workers taking control over the reins of production, over the machinery, over the city itself. The right to the city in that sense is a right against idiocy. It's a right to be part of the public. It's a right against all the kind of things in cities that alienate us from both other people and from how cities are constructed. BROOKE GLADSTONE: I wonder if you'd share a conversation you overheard on a bus between two older women and a visually impaired man chatting about proposed changes to the public transit system in Poughkeepsie, New York. It's an old city. It's certainly not a rich city. KAFUI ATTOH: These are people who rely on the bus every day and they're talking about, they're like what is consolidation going to mean for me. The bus driver asked them, he's like 'look this is you guys have great comments, the debates are happening right now at city council meetings and you should go' And one or two of the people were like, 'yeah but the buses stop running at 6:30 and the City Council meeting starts after the buses stop running so there's no way I would be able to get home.' You know, even having a conversation on the future of buses was limited by the bus system itself. BROOKE GLADSTONE: There was another anecdote in your preface about the shoppers' special. BROOKE GLADSTONE: They didn't see themselves as having a right either. BROOKE GLADSTONE: He's right here, Jon Hanrahan. KAFUI ATTOH: Yeah. When he called me and told me the trope of the guy who's hard on his luck walking 25 miles to work and the community starts to Kickstarter to buy him some jalopy, I feel like it's the same thing. The kind of failure of public transit it doesn't rise to the level of importance that it should. You know, I just read a report that was put out by the international transportation forum about the degree to which if we are serious about mitigating greenhouse gas emissions and slowing, just slowing, the pace of global warming there needs to be a radical shift in how we think about personal transportation. And that more of us will need to be getting on public buses and getting out of private automobiles becoming less idiotic, I would say. If the buses aren't there or if the buses are in the shop or if that's the attitude we have, it doesn't look good. BROOKE GLADSTONE: And we'll still have people whose cars have broken or who can't afford one walking 25 mile round trips to work. KAFUI ATTOH: Yeah, yeah. No right to the city, no rights at all. BROOKE GLADSTONE: Kafui, thank you very much. BROOKE GLADSTONE: Kafui Attoh is a professor of urban studies at the City University of New York Graduate Center. BOB GARFIELD: That's it for this week's show. 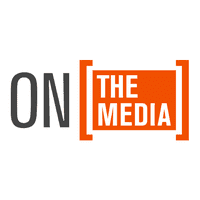 On the Media is produced by Alana Casanova-Burgess, Micah Loewing, Leah Feder and Asthaa Chaturvedi. But this week's show was the brainchild of John Hanrahan. We had more help from Samantha Maldonado and our show was edited by Brooke. Our technical director is Jennifer Munson. Are engineers this week where Sam Bair and Josh Han. BROOKE GLADSTONE: Katya Rogers is our executive producer. Jim Schachter is WNYC vice president for news. Bassist composer Ben Allison wrote our theme. On the Media is a production of WNYC studios. I'm Brooke Gladstone. BOB GARFIELD:And I'm Bob Garfield. FEMALE CORRESPONDENT: Support for the media comes from the Overbrook Foundation and the listeners of WNYC Radio.